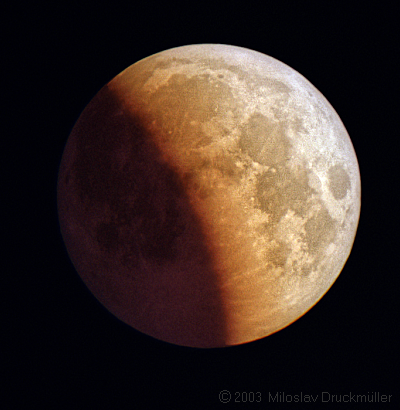 After the beginning of the partial phase it was obvious that it would be very dark eclipse because the part of the Moon in the umbral shadow was nearly invisible with naked eyes. I remembered the techniques I use for the total solar eclipse photography and made images with various exposures. The sum of two images was used for creating the picture you are looking at. The image was processed by adaptive filter to manage bigger contrast. The image is near that I saw in my telescope. The sky is of very dark blue color on the image because the dawn was in progress. Click on the following reference to display the same image in the maximum quality (232 KB, PNG format).